NEW - Super Duty x250 series supports 250 Lbs. Visit the library to browse articles.. The all new x250 series antenna measurement systems are the newest addition to the Diamond Engineering lineup Featuring dual-axis encoded stepper movement with advanced 3D Measurement Software. A new Ethernet control option eliminates the need for the now dissapearing RS-232 communication port. 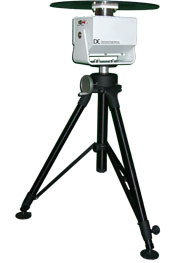 A 400lb capacity tripod is included for the most demanding loads. The DAMS x100 series Antenna Measurement Systems provides you with all of the tools necessary for accurate Antenna Measurements. Featuring dual-axis precision movement with advanced 3D Measurement Software to give you a true representaion of your measured Antenna. The FSM5 - Full Spherical Mount is now available to order. This low reflection attachment fits directly onto your existing x000 series antenna measurement system enabling complete spherical antenna measurements in one step while maintaining phase center. Efficiency calculation software is also included with the system. Please contact with me !Thank you very much .